The Mount was to be a writer’s retreat and also a place for entertaining distinguished guests like Henry James, the Vanderbilts or her neighbors at Ventfort Hall, the George Morgans. Inspired by the 17th century seat of Lord Brownlow, Belton House, and classical Italian and French architecture, she used the principles detailed in her first book, The Decoration of Houses (1897), when she designed the house. 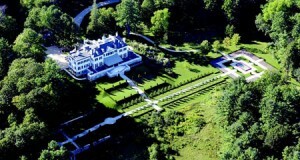 Accordingly, she stressed that “good architectural expression included order, scale, and harmony.” On a plot of 113 acres, the house overlooked Laurel Lake, with spectacular views to the Berkshire Hills and beyond, its striking white stucco exterior set off by black shutters and rose from a foundation of coarse field stone. Three stories at its entry elevation, this main house is augmented by Georgian Revival gatehouse and stable, and a greenhouse, while the garden side was of two stories, with an opening onto the large, raised stone terrace overlooking the grounds. A visitor to the house would enter from a courtyard, then ascend a flight of steps to the main floor where the principle spaces–library, drawing room, dining room and sitting room–would open onto a terrace which offered that spectacular view of the lake and the hills. From this terrace, a Palladian staircase led to a “lime walk” of linden trees, which connected the two formal gardens on the estate. It was here Edith Wharton wrote several of her novels, including The House of Mirth, the first of many chronicles of the true nature of old New York, and entertained the cream of American literary society, including her close friend, the novelist Henry James. But this haven failed to completely soothe Wharton’s restless spirit; acerbated by Teddy Wharton’s alcoholism and general dissipation, she sought refuge in Europe and by 1910, the Wharton’s had separated. 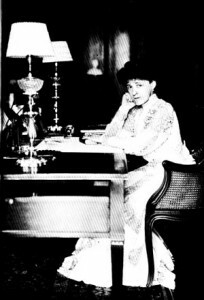 After selling The Mount in 1911, they finally divorced in 1913 and Wharton remained primarily in Europe, where she continued to write, publishing such masterpieces as her Pulitzer Prize winning novel, The Age of Innocence and her final, incomplete manuscript, The Buccaneers, before passing away in 1937. In the meantime, The Mount was passed from owner to owner, first a private residence, then a girls’ dormitory for the Foxhollow School, and the site of the theatre company Shakespeare & Company. 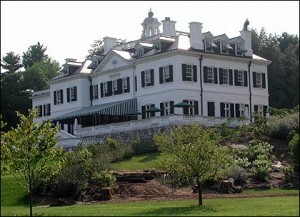 It was finally purchased by Edith Wharton Restoration, which has restored much of the property to its original condition. Currently open from May to October for visitors and tours, The Mount unfortunately faces foreclosure after 106 years of existence. Despite this hovering dark cloud, the estate nonetheless retains the elegant, precise charm of Wharton’s imagination. I’ve been meaning to read The Buccaneers ever since I read about it in the Anglomania book. This was an excellent post. Your description of The Mount gave me a great visual. If the house is facing foreclosure, maybe the restoration group should open the house as a writer’s refuge/hotel/conference location. I bet that would garner a lot of money and would uphold the prestige of the place as being primarily for the writer at heart. But then, maybe that’s not part of their contract with their creditors. I’m sure there are a lot of papers they would have to fill out and fees and taxes to pay in order to re-zone the place as a hotel/conference location. But it might be worth it if the point is to keep the place as a landmark. I mean, really. What aspiring writer wouldn’t like to walk the grounds of a famous American author, hoping to soak up a bit of residual creativity? People have traveled to lesser places for more money. Oh do, Belinda. It’s a pretty wonderful book, though The House of Mirth is my favorite Wharton novel, followed by Glimpses of the Moon and The Custom of the Country. The writers retreat idea is a great one–I know I’ve been dying to get to the East Coast and visit this house, among others (which is why I’m so upset over the news of the foreclosure!). Wonderful post. I’ve donated money to the cause a few months ago when I first heard that it was facing foreclosure. It seems a shame that the state of Massachusetts doesn’t step in to save it. 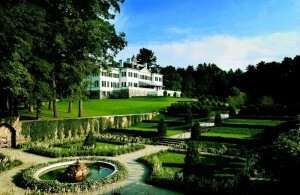 I agree with Belinda that it would be a great place like Yaddo for writers.